Ted Cheeseman says he is ready to announce himself on the big stage when he takes on Spain’s undefeated European Super-Welterweight Champion Sergio Garcia at The O2 in London on Saturday, live on Sky Sports in the UK and DAZN in the US. The Bermondsey star, 15-0, inflicted a punishing defeat on Reading bad boy Asinia Byfield to claim the vacant British title last time out. 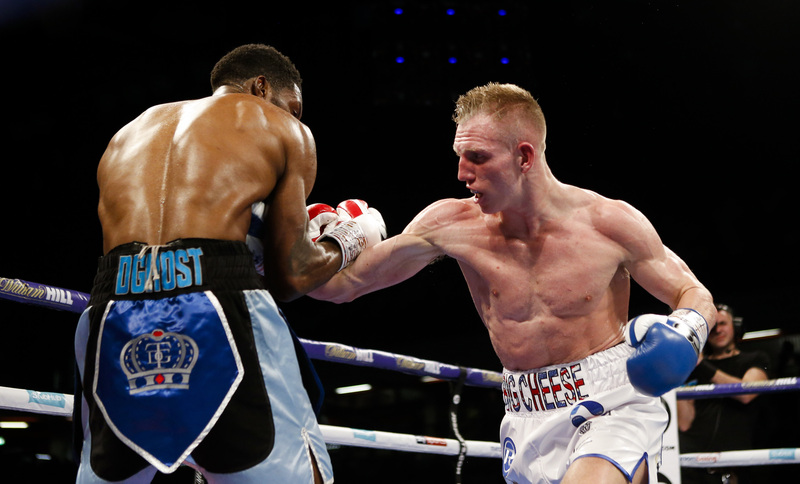 A defence of the Lonsdale belt didn’t interest ‘The Big Cheese’, who has instead opted to continue his push towards World glory. “To be honest, sometimes you sit there and think ‘cor, I could do with an easy one now’, but as a fighter you love being involved in testing fights,” said Cheeseman. “You want to get everyone talking about you and to be known as someone that is tough and will fight anyone. I think I’m starting to get a reputation as someone that won’t turn down a challenge. “I’m one of those fighters who will always look at what opportunities there are out there for me. After the Byfield win, Charlie Sims asked me if I’d looked at any opponents to defend my British title against. There isn’t anyone else at British level other than Fowler or Fitzgerald that I’d be interested in defending it against. I’d rather not just have an easy defence and try to win the belt outright. I’d rather push on and aim at what I turned pro to do, and that’s to become a World Champion. A step-up to European level has been difficult for fellow Brits such as Lewis Ritson, who suffered his first career loss to Francesco Patera at the Metro Radio Arena in October, but Cheeseman believes his ring experience will help him earn another impressive victory in London. “On paper, Garcia looks exceptional,” admitted Cheeseman. “He’s 28-0, 13 knockouts. A lot of people are saying to me ‘Do you really need this fight yet? Is it a step too far?’. But I’ve got a good manager, a good coach. I’m coming on in the gym all the time. These are the fights I need. I’m pushing on and hoping to go all the way. “I’m feeling much more experienced now with my timing in the ring, my ring craft, and I can’t wait to get in there and show everyone how good I am. I’ve had test after test and I’m 100% confident of getting the win. It’s not like I’ve just had one test and now I’m stepping up. I’ve done it for the last two years. I’m firing on all cylinders in the gym, feeling really good. Garcia vs. Cheeseman tops a huge night of action in London. Unbeaten British Cruiserweight Champion Lawrence Okolie returns to action as he defends his WBA Continental title against Hungary’s Tamas Lodi. Rising Wokingham Middleweight talent Felix Cash fights for his second professional title when he takes on Nigeria’s Abolaji Rasheed for the vacant Commonwealth strap. Preston’s Scott Fitzgerald keeps busy in a six round contest ahead of his mouth-watering domestic clash with former GB teammate Anthony Fowler in March.